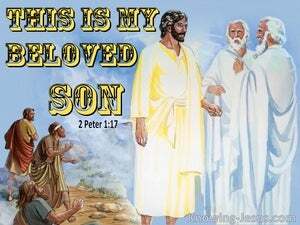 ﻿ 2 Peter 1:17 For he received from God the Father honour and glory, when there came such a voice to him from the excellent glory, This is my beloved Son, in whom I am well pleased. For when He received honor and glory from God the Father, a voice came to Him from the Majestic Glory: This is My beloved Son. I take delight in Him! For he received honor and glory from God the Father when these words from the Majestic Glory were spoken about him: "This is my Son, whom I love. I am pleased with him." For having received from God the Father honor and glory from a voice of such kind brought to him from the Majestic Glory, This is my Son, the beloved in whom I am well pleased. For Jesus had received honor and glory from God, the Father, when [God's] voice came to Him from the Majestic Glory saying, "This is my dearly loved Son, and I am very pleased with Him." For he received from God the Father honor and glory, when there came to him from the magnificent glory a voice, such as this: This is my beloved Son, in whom I delight. For God the Father gave him honour and glory, when such a voice came to him out of the great glory, saying, This is my dearly loved Son, with whom I am well pleased. For he received honor and glory from God the Father when the voice came to him by the Majestic Glory, saying, "This is my beloved Son, with whom I am well pleased." 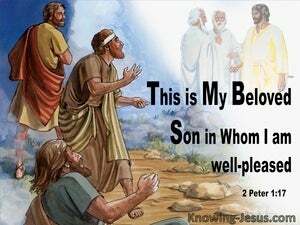 for he received this honourable and glorious testimony from his father, when the voice broke out from the magnificent splendor, in these words, "this is my beloved son in whom I am well pleased." for when he received from God the Father honor and glory, a vice to this effect came to him from the magnificent glory, "This is my Son, the beloved, in whom I delight." For having received from God the Father the honor and glory of such a voice having been borne to him from the excellent glory, This is my beloved Son, in whom I am well pleased. For when he was so honored and glorified by God the Father and from the supreme glory there were borne to him such words as these: "This is my Son, my Beloved! He is my Chosen!"? ?18 we heard these words borne from heaven when we were with him on that sacred mountain. For he received honour and glory from God the Father, when there came such a voice to him from the excellent glory, This is my beloved Son, in whom I delight. For having received from God the Father honour and glory, and such a voice brought to him from the magnificent glory, This is my dearly beloved Son, in whom I was contented. 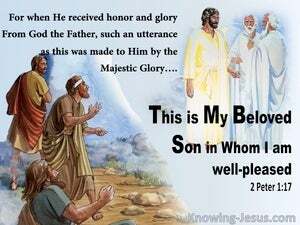 For [he] received honor and glory from God the Father [when] a voice such as this was brought to him by the Majestic Glory, "This is my beloved Son, in whom I am well pleased." For He received honor and glory from God the Father, when was borne to Him a voice from the excellent glory, "This is My beloved Son, in whom I am well pleased." when he was invested with honour and glory by God the Father, and when the following voice was borne to him from the sublime Glory, "This is my son, the Beloved, in whom I delight." For he received honor and glory from God the Father, when that voice was conveyed to him by the Majestic Glory: "This is my dear Son, in whom I am delighted." For he received from God the Father honor and glory, when the voice came to him from the Majestic Glory, "This is my beloved Son, in whom I am well pleased." For he received from God the Father honor and glory, when such a voice as this was borne to him from the excellent glory: "This is my beloved Son, with whom I am well pleased." For he received from God the Father honor and glory, when this voice was brought to him from the magnificent glory, This is my beloved Son, in whom I am well pleased. For he received from God the Father honour and glory, when such a voice was sent forth to him from the transcendently magnificent glory, This is my beloved son, in whom I am well pleased. He received honour and glory from God the Father, and out of the wondrous glory words such as these were spoken to Him, "This is My dearly-loved Son, in whom I take delight." For when He received such honor and glory from God the Father, when from the majestic glory there was borne to Him a voice like this, "This is my Son, my Beloved, in whom I take delight,"
For He received from God the Father honor and glory when a voice came to Him from the magnificent glory, saying, "This is my beloved Son, in whom I am well pleased."